In 1920 Avery Hopwood was America's most successful playwright, achieving the distinction of having four concurrent hits on the Broadway stage. Jack F. Sharrar's critical biography makes use of a rich array of primary sources--including Hopwood's unpublished novel and his letters to such friends as Gertrude Stein, Carl Van Vechten, and Mary Roberts Rinehart--to chronicle Hopwood's life and career. The book provides fresh insights on the playwright, his plays and the personalities who produced and performed in them, by surveying the commercial theater of the period. Until recently out of print, the new edition includes a foreword by Nicholas Delbanco, director of the University of Michigan's Hopwood Awards in Creative Writing Program; an afterword by Sharrar that sheds new light on the passionate, tumultuous relationship between Hopwood and John Floyd; and many rare illustrations from American theater history. Jack F. Sharrar, Ph.D., is Registrar and Director of the M.F.A. Program, American Conservatory Theater. Nicholas Delbanco is Professor of English and Director of the University of Michigan's Hopwood Awards Program. His most recent novel is Old Scores (Warner Books, 1997). Even though I long knew that Gertrude Stein very much liked Avery Hopwood, I didn't become really interested in his life and work until recently, when I read the collected letters, recently published by Oxford University Press, of Gertrude Stein and Virgil Thomson.In one of his letters to Gertrude Stein, Virgil Thomson tries to console her about the loss of her friend, Avery Hopwood, through death.In a footnote to that letter, the editors explain that Avery Hopwood's death was a bit mysterious, drowning as he did while swimming and drinking and taking cocaine on the French Riviera, bruises on his body, and he was only 46.I very much wanted to learn what lay behind the mystery of his death and so I pounced upon the only biography of him that's ever been written.Avery Hopwood has been dead for more than 80 years and Jack F. Sharrar has written the one and only biography of this wealthy, famous playwright of the Prohibition Era, now twenty years ago, written when the biographer was 40 years old.He is now 60. Well, according to his biographer, poor Avery never had quite resolved his attitude toward his own homosexuality within his lifetime and thus had felt conflicted about it most of his life.It was this, so the author says, that led him finally to drink and drugs, although his career as a playwright was suffering as well once the demand for farce comedies filled with flappers, gold diggers and alcoholic bedroom scenes had ended. (The biographer actually reverses the causes for his inner conflict, making Avery's career of greater importance than his closeted homosexuality, but Avery's life-as-drama makes more sense the other way round.) Once Avery even snorted cocaine in front of Alice B. and Gertrude one night after he had invited the two of them out to a Parisian nightclub!He must have been out of his mind to think he could get away with some like that in front of Gertrude and not lose his friendship with her!Just before his death, however, Avery apparently had broken off an affair he'd been conducting with an absolutely handsome man, a John Floyd -- a playwright himself, with large eyes and thick wavy hair --, and Avery had been telling everyone later how he feared how his boyfriend would come after him and kill him since Avery had been very brutal in the way he ended his relationship with the guy back in the States. (Avery just didn't feel comfortable living together with another man and wanted out of the relationship and got out the best way he knew how:brutal (and mean) honesty. )Well, John Floyd did come after him and did try to find him -- but Avery had already drowned before John Floyd ever got a chance to speak with him (or put a hand on him).Nobody is quite certain where the bruises on Avery's body ever came from.He could have gotten them just from falling down drunk a little too often.And then after Avery's death, nobody knows how or why, John Floyd winds up in a mental asylum in New Jersey or Pennsylvania (I forget which now) -- for the rest of his life.Though the author of this biography never says so, Avery Hopwood nonetheless leaves John Floyd a sizeable sum of money in his living will. 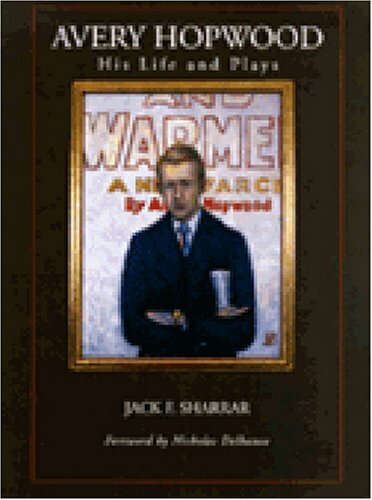 Jack Sharrar writes a very staid, straight-forward (almost straight-laced), chronological biography with a definite whiff of the Ph.D. thesis in the writing, though it is very informative, possessed of some narrative drive, and is highly detailed in his depiction, through summary, of many Hopwood plays and he effectively depicts the time-period in which Avery Hopwood lived and wrote such that actors and composers from the past come alive once more on the page (if a bit dryly), actresses like Irene Bordoni, composers such as Ivor Novello (whose lyrics today, I now understand, are still being sung by the likes of Amy Winehouse), and novelists such as Mary Roberts Rinehart who was a frequent collaborator with Avery Hopwood plays.